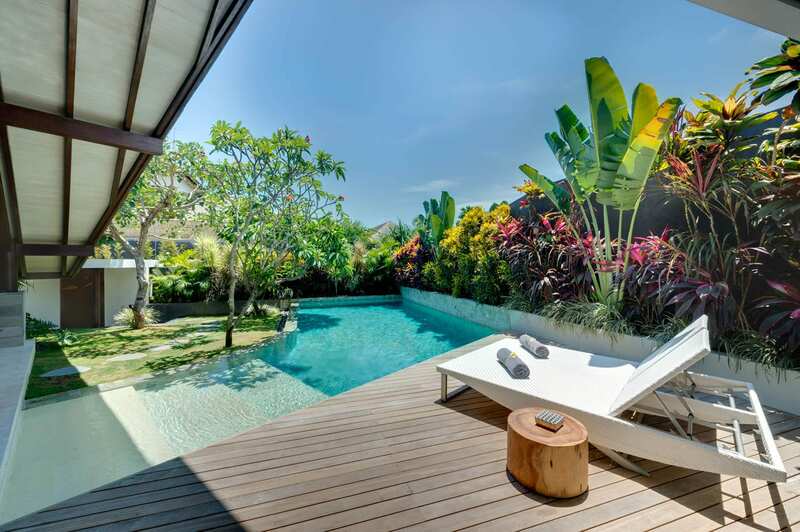 Space may be at a premium in trendy Seminyak, but not at Villa Kinara where expansive gardens house 6 luxury bedrooms, open-air living and dining areas, a media room, swimming pool and plenty of outdoor seating areas spread out over 3 pavilions. If you’re travelling with a group of friends or a few families, this is the perfect spot with room to roam and luxury to lap up. 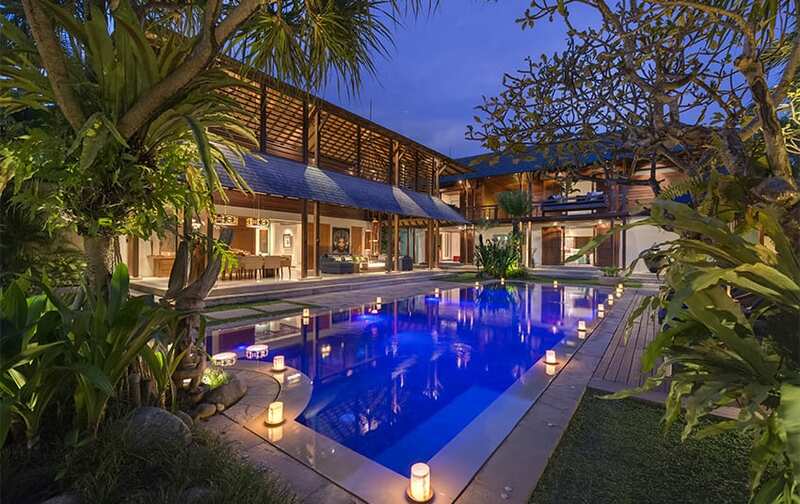 Villa Kinara is an elegant blend of traditional Indonesian architecture and modern luxury living. 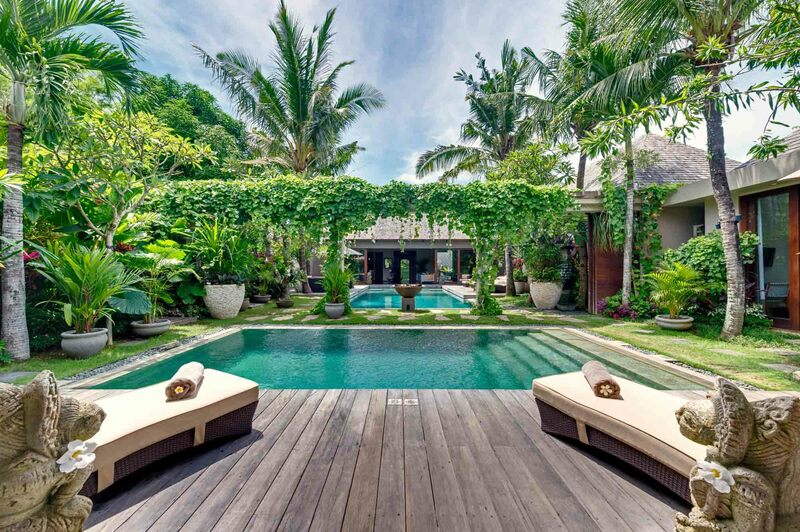 The villa was constructed using natural building materials like teak wood, Palimanan stone, bamboo, rattan and coconut shells. 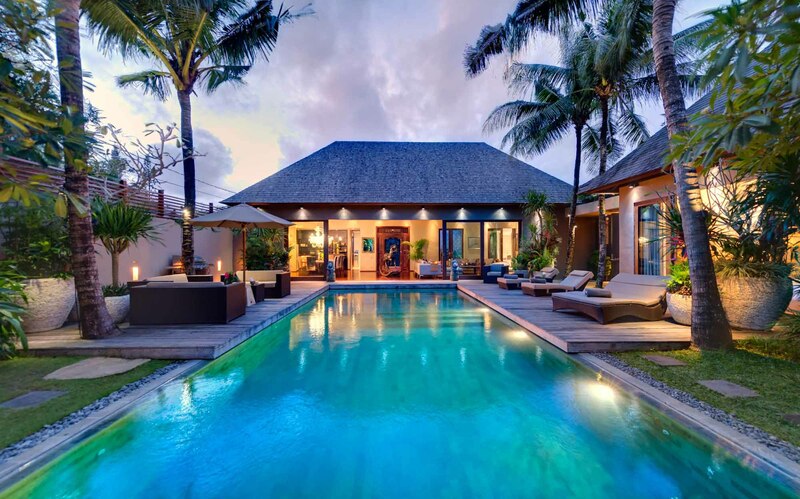 Soaring alang alang roofing creates a sense of space, and the wooden shutters on the doors and windows are inspired by Dutch colonial design. 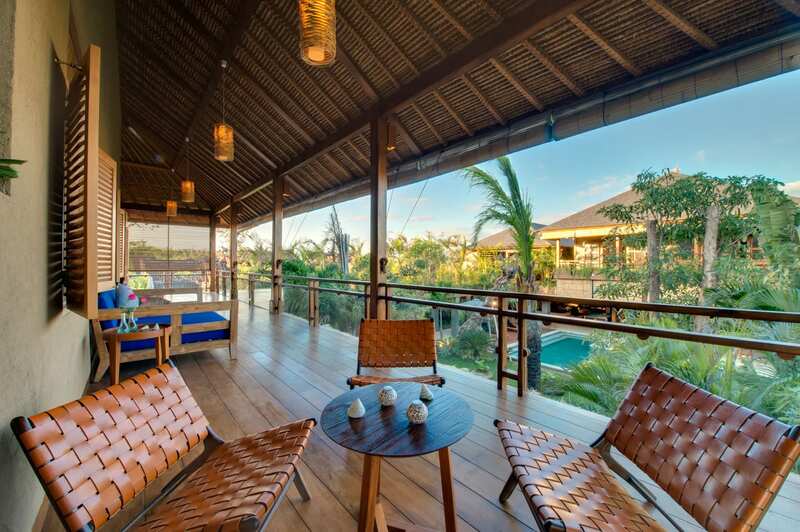 Here you’ll find large terraces and open communal gathering spaces, as well as many private corners for moments of solitude. 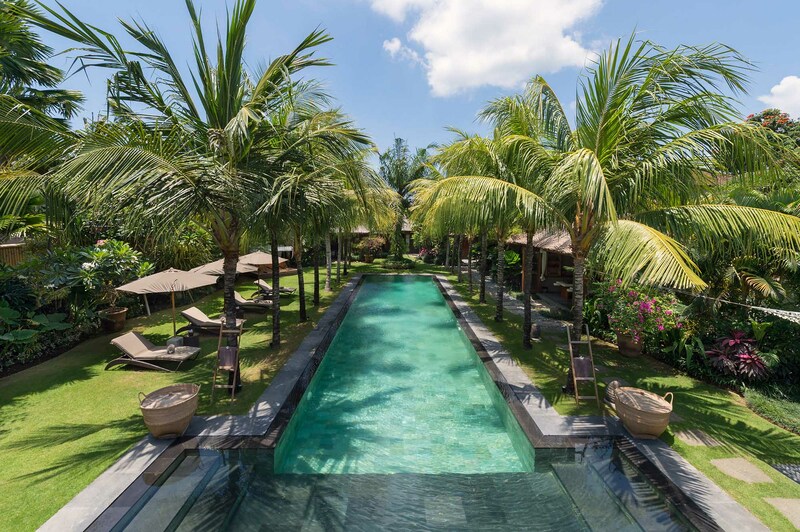 From the minute you step onto the manicured grounds, you’ll be hard pressed to leave, as the swimming pool beckons with its cool waters and tranquil water features, and the garden begs to be explored for its fragrant frangipani trees and shady palms. 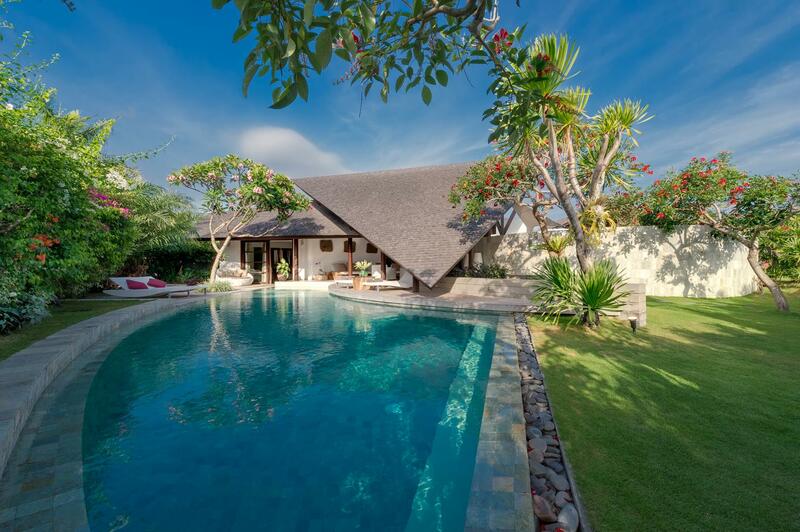 Moreover, the villa itself has many attractive features including a fully stocked bar, billiards table, home entertainment centre, and breezy bedrooms with designer furniture. 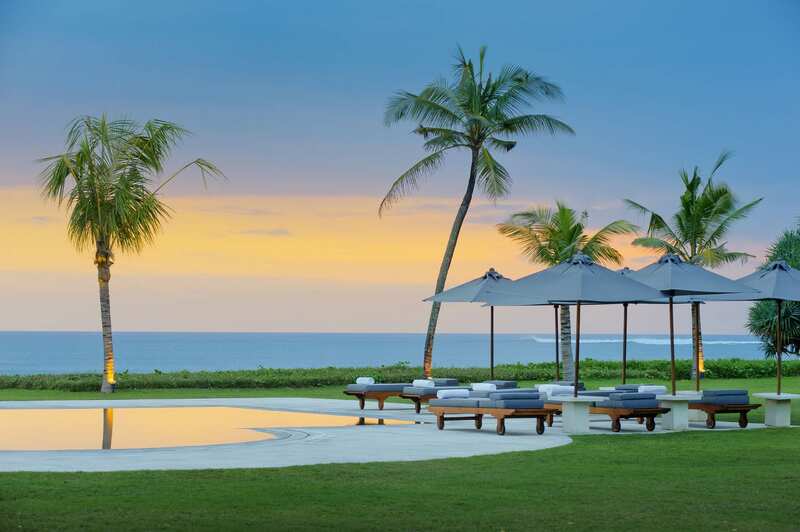 Of course, if you do venture out from this stunning sanctuary, you are just minutes from everything that makes Seminyak so sought after. 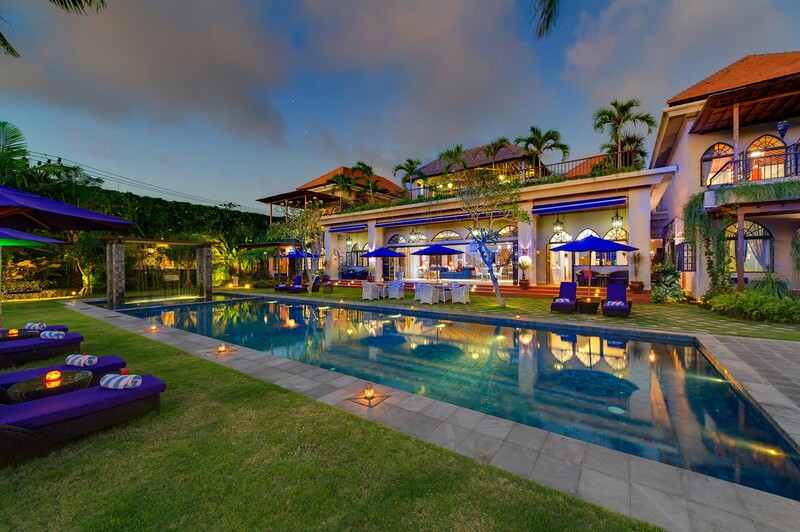 Think world-class restaurants, shops and nightclubs, as well as the long sandy stretch of Seminyak Beach. 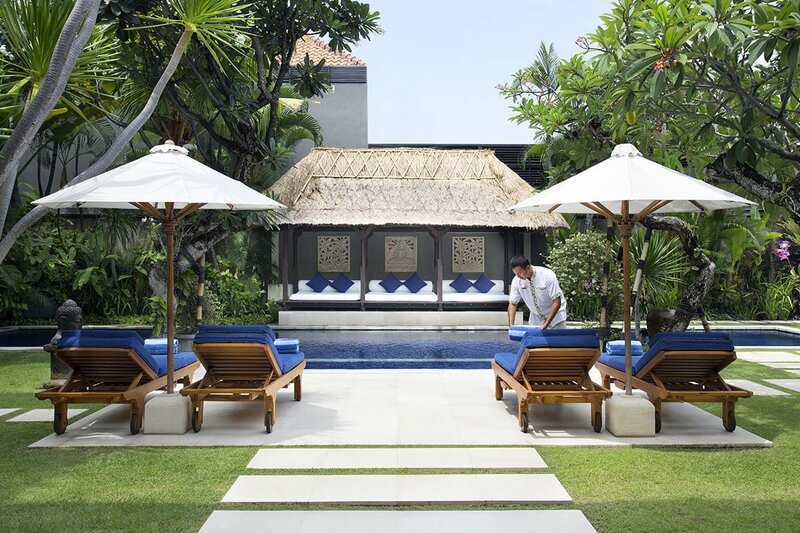 For great food, drinks and beats at a beachside setting, Ku De Ta is just five minutes away. 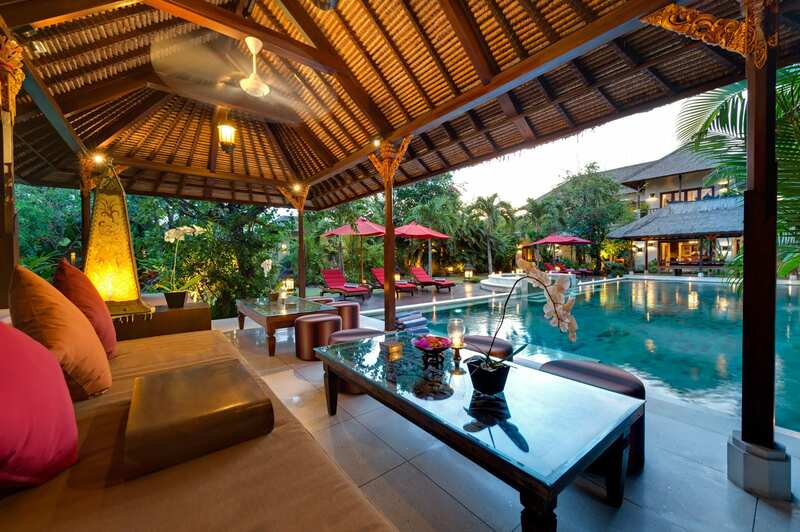 The rooms at Villa Kinara are spread out over 3 pavilions that flank the swimming pool. 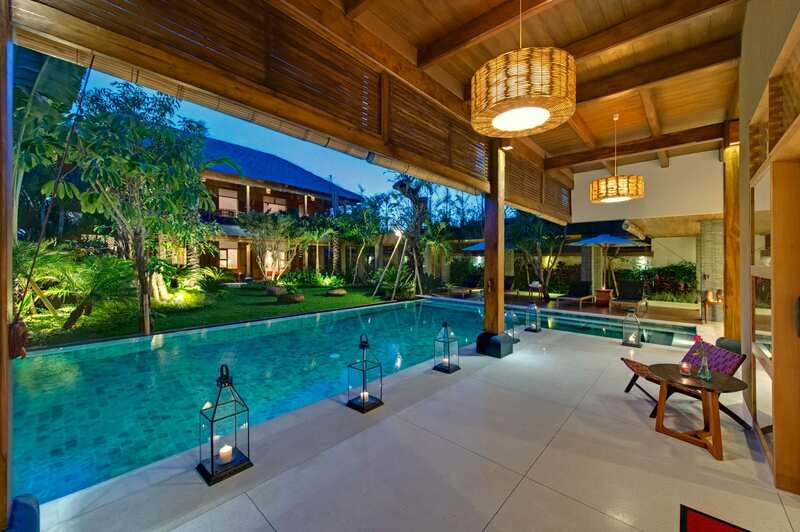 On one side, there are two connected pavilions, the biggest of which has an open-plan living and dining area that encompasses the entire ground floor. 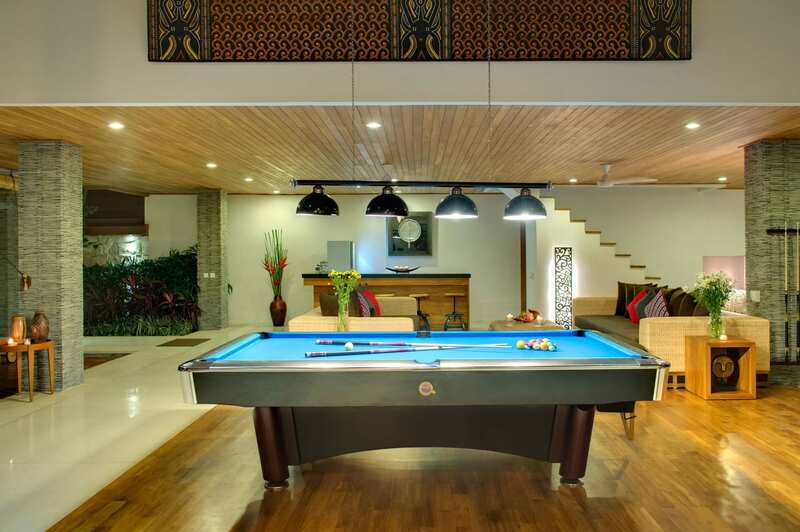 This space has oversized sofas, a 42-inch flat screen TV and entertainment system, billiards table, and a huge dining room table that can seat up to 12 people. 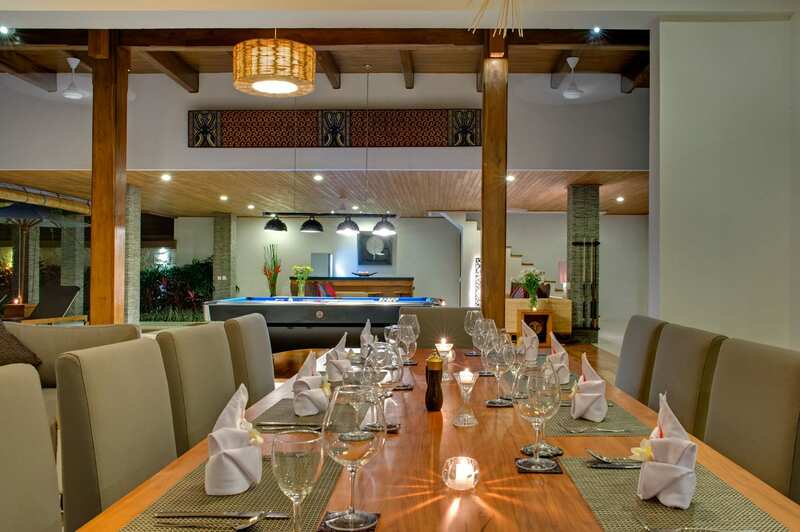 Behind the dining area there is a fully equipped guest kitchen and a separate staff kitchen. 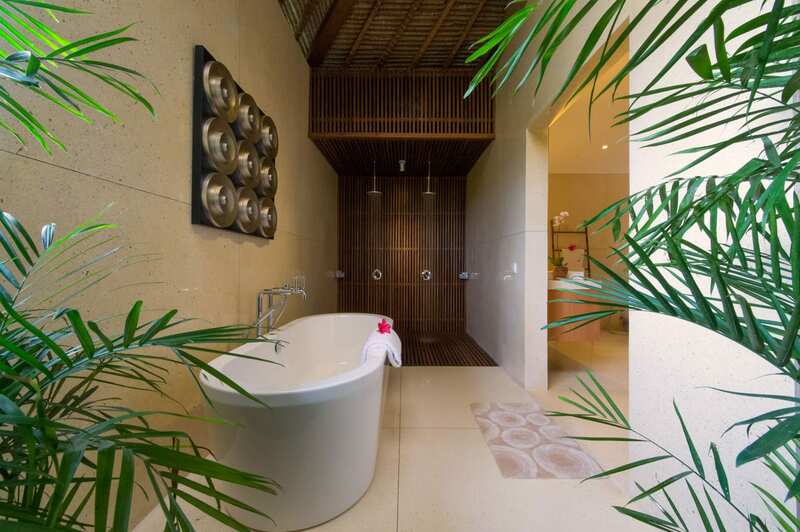 On the second floor of the main pavilion, there are two light-filled ensuite bedrooms. 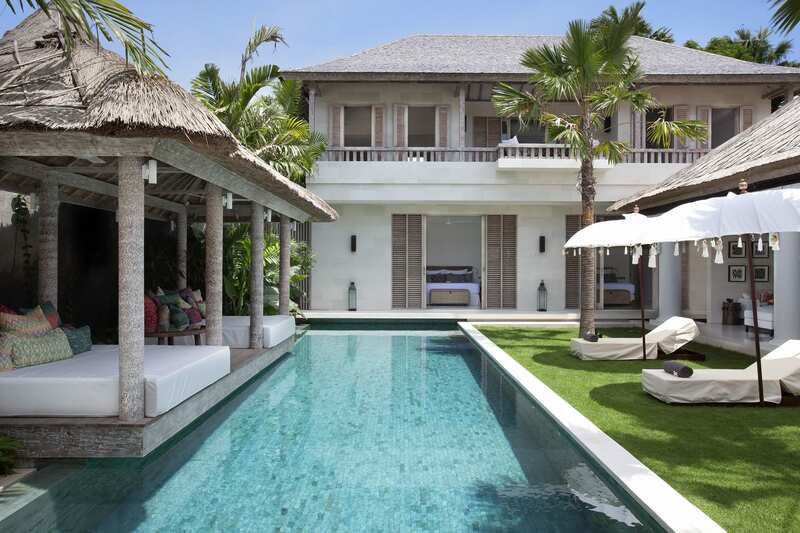 The other bedrooms can be found in the alang-alang pavilion, including the palatial master suite on the top floor, and two guest bedrooms on the ground floor. Finally, a garden walkway leads to the third pavilion, which houses the media room with everything you need for a home cinema experience. This room also functions as a guest room. Each bedroom has luxurious furnishings and amenities like king beds, writing desks, sofas, flat screen TVs, and ensuite bathrooms with rain showers and bathtubs. 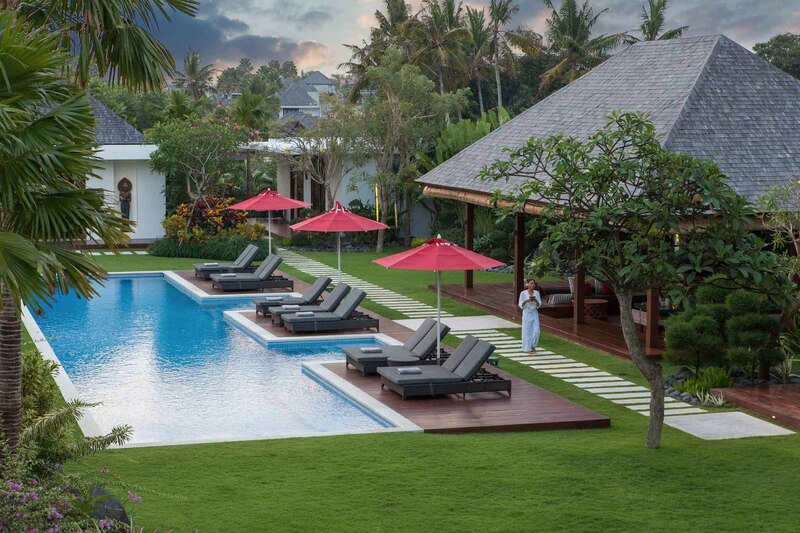 One of the most appealing aspects of Villa Kinara is the sheer number of outdoor spaces to enjoy. 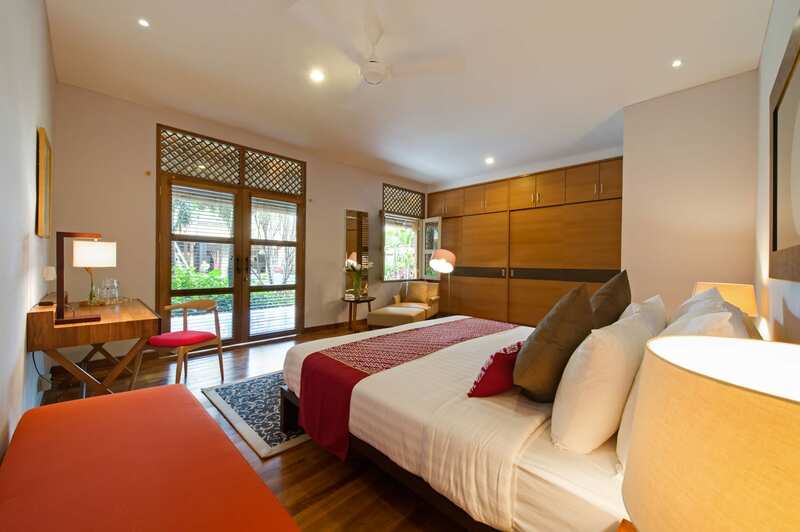 Each bedroom has a large terrace with daybeds or soft seats that are perfect for curling up with a good book or a nap. 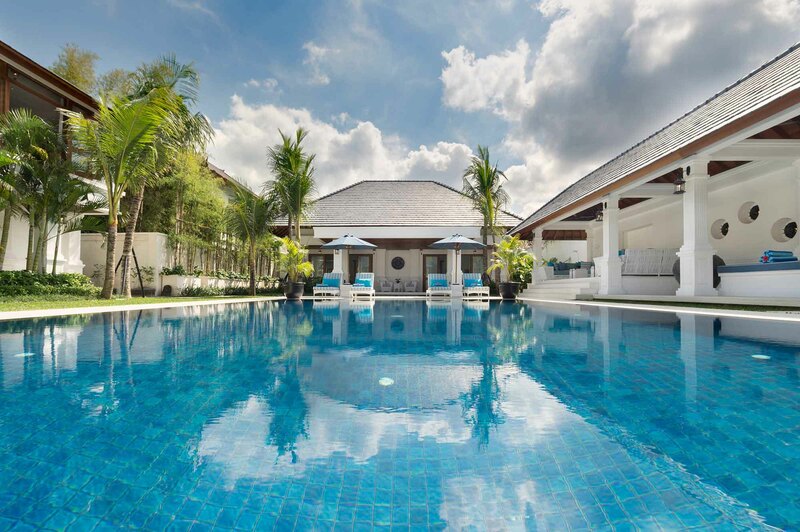 In addition, the 14-metre pool has shallow steps for easing yourself in, as well as plenty of room to do laps or let the kids splash around. 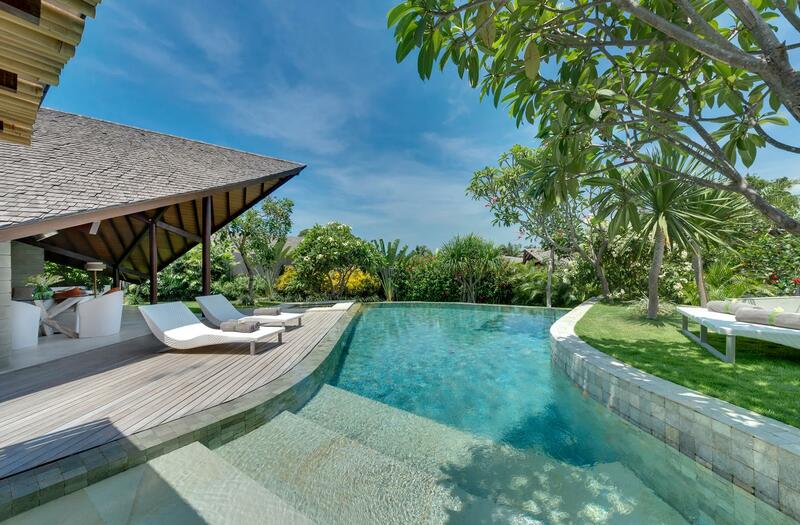 The pool is also complemented by sun loungers and parasols on ironwood decks. CAPACITY 12 people (4 bedrooms with king-size beds, 2 with twin beds). 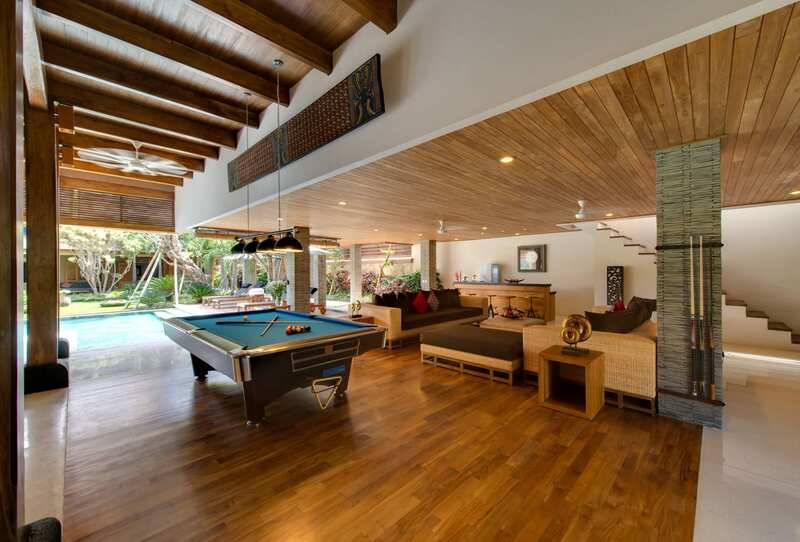 LIVING AREAS Open-plan living room, bar, indoor dining for 12, media room, pool deck, furnished terraces. DINING The villa's skilled chef will happily prepare anything from the Western, Asian, vegetarian and children's suggestion menus. COMMUNICATION WiFi Internet access, telephone for local calls. ENTERTAINMENT 52inch, 46inch, 40inch flat-screen TVs, 3 home entertainment centres, books, billiard table. FOR FAMILIES Baby cot, high chair. 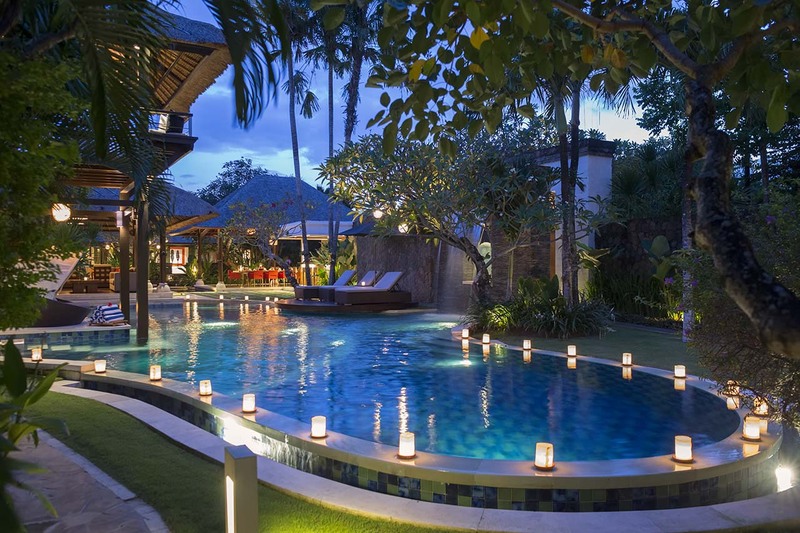 SPA In villa treatments can be carried out by professional beauty therapists (extra cost applies). ADDITIONAL Safety deposit box and back-up power generator. 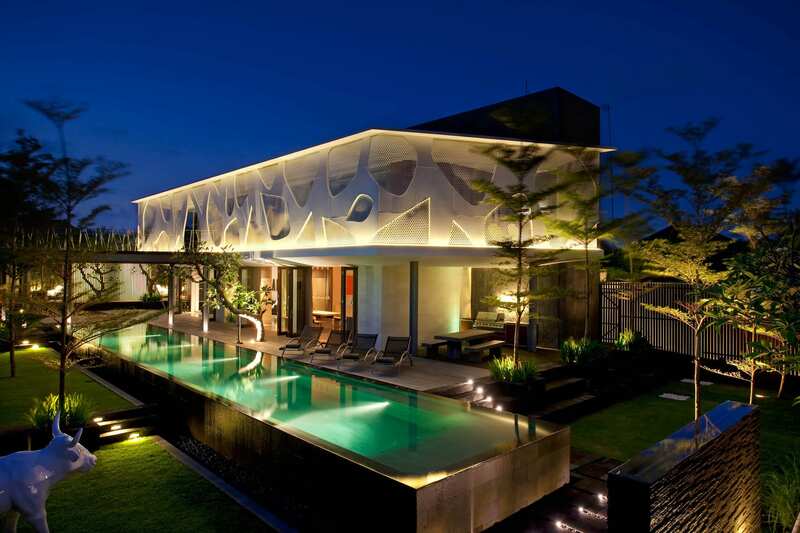 PROPERTY AREA 1,000sqm land area (800sqm floor size). Wonderful! 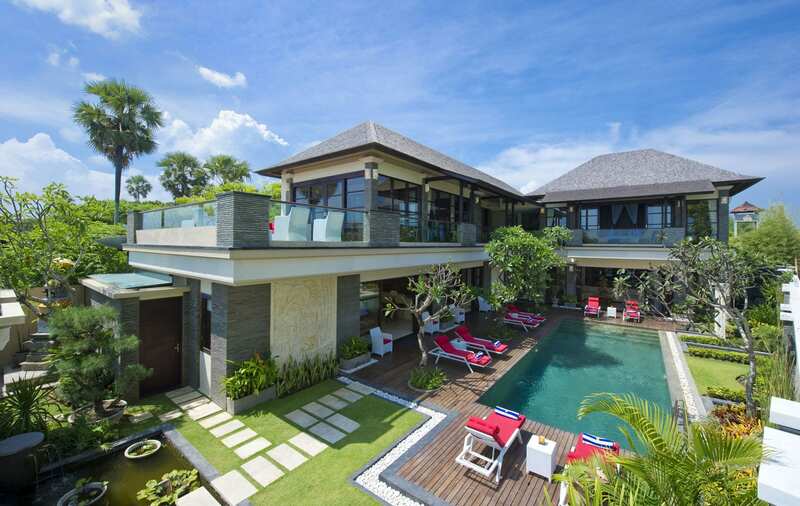 !....a beautiful Villa, superbly well laid out for relaxing family or big group holidays. Added to this, an amazing staff who made us feel so welcome and were so kind, thoughtful and lovely that we all just wanted to stay there forever!....Thank you Maria and her team for making our holiday so perfect. 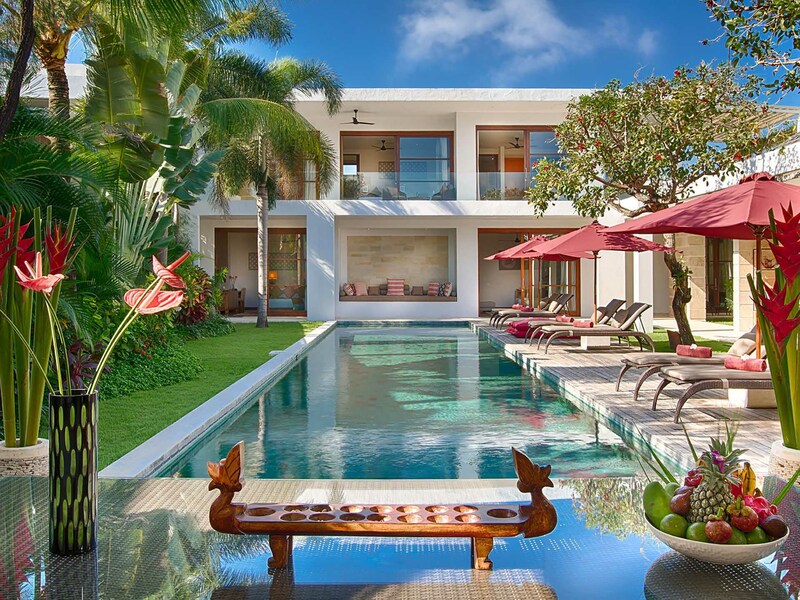 This villa was quite amazing. Plenty of space for our group of 12 and the location was close to everything you needed. The staff were a absolute pleasure and nothing was too much of a trouble for them. Would highly recommend this to anyone and i can't wait to return asap! We had a great stay with 10 girlfriends. The staff were discrete but always available. Nothing was to much for them, they were very accommodating. 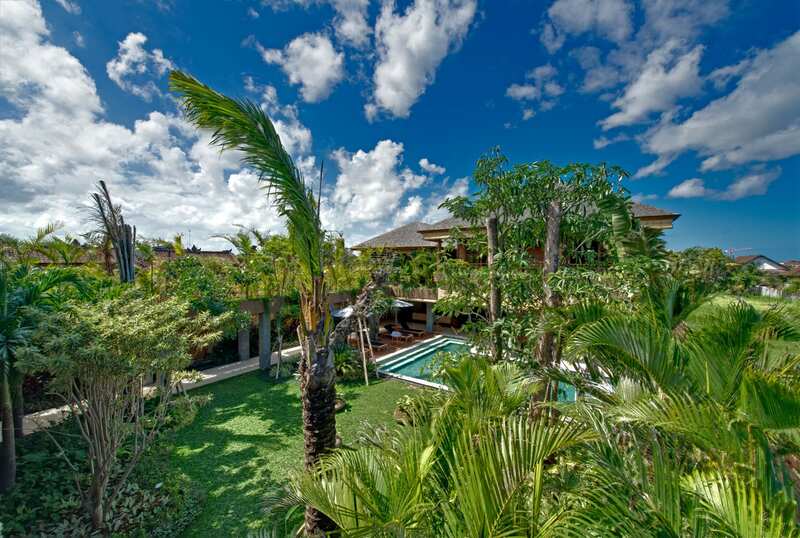 A perfect location to stroll to the beach, shopping, day spas and restaurants. Continuously cleaned and immaculate at all times. Fantastic accommodation and location for our purposes. 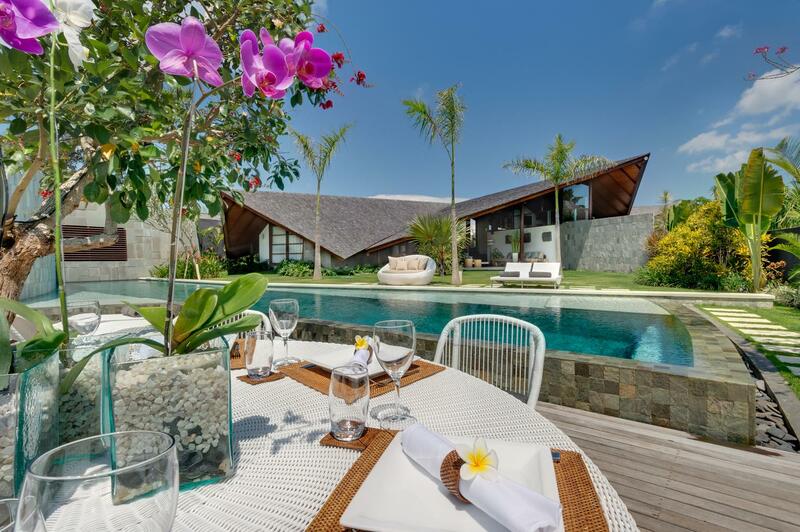 This villa far, far exceeded our highest expectations. All nine of us ranging in age from 12 to 70 felt like we were living in a dream. The accommodation is truly 5 star, with every last modern comfort readily available. The staff are tremendous, so pleasant and helpful. 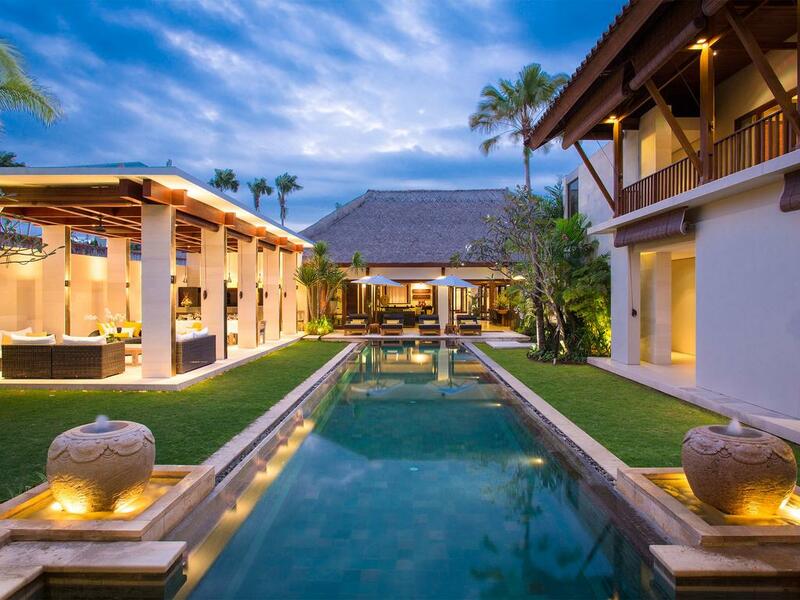 The location perfect for the beach, shopping, touring and the rest. I would recommend it to everyone ( and I have had the pleasure of staying in quite a few 5 star hotels around the world). Thanks to all who made our stay so amazing. 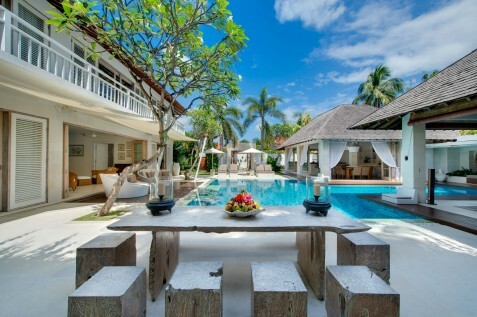 This villa was above and beyond anything our group ever expected. It was truly amazing. Staff were absolutely lovely and did everything the could to make our stay a memorable one. 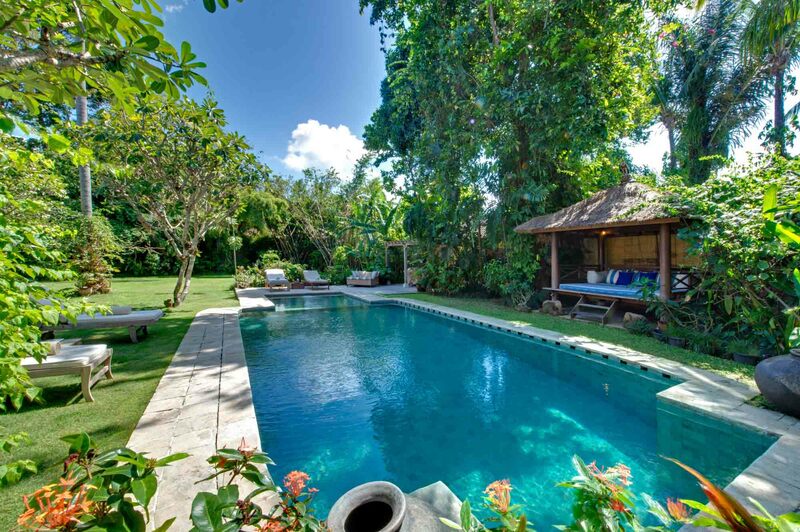 We loved staying at Villa Kinara and will be back next year. I cannot recommend this place enough. Gardens were amazing as were the rooms. Very clean and so big.